Blockchain and IoT will become critical business strategy elements. As a business strategy these solutions are very capable to being transformative and cause disintermediation through the elimination of many internal and external legacy business processes and activities. As a result, a company’s blockchain strategy needs to be an integral part of the strategy for the entire enterprise and all of the company’s stakeholders. When the company’s blockchain strategy includes IoT, it becomes more complex and more robust. Each of these workshops are customized for each company and provide a facilitated methodology for senior leadership teams to learn, justify, strategize and implement Blockchain and IoT into their business. Depending on the level of understanding and the time constraints for each senior leadership group, we can mix and match any combination of these workshops. Take the Blockchain survey to acquire insight on the blockchain maturity in your organization as a first start. You will receive a customized report that is based on you inputs. The survey results will help us craft a blockchain program that is appropriate for you and the members of your organization. Learn more about Scioebc Group50’s Blockchain – IoT solution here. 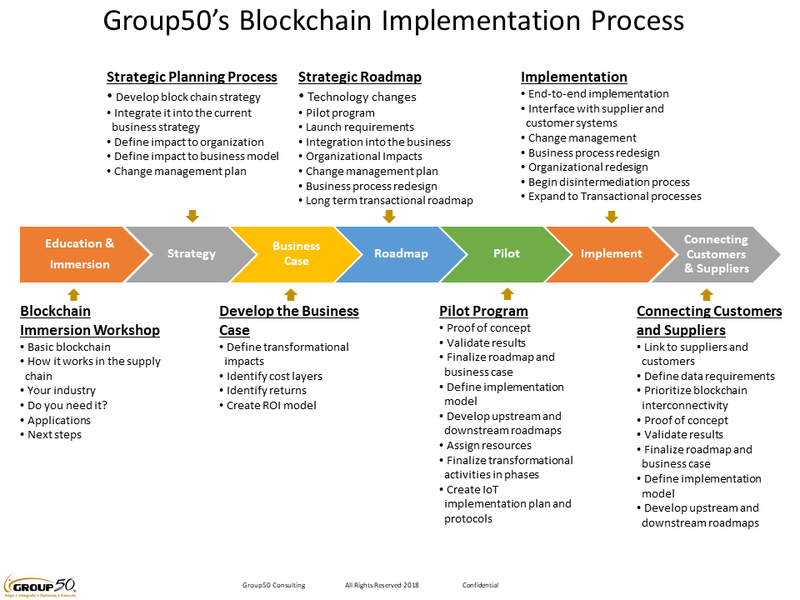 You can speak to a Group50 blockchain expert at (909) 949-9083, drop us a line at blockchain@group50.com or requesting more information here.